hdc back loop, front loop, back loop. 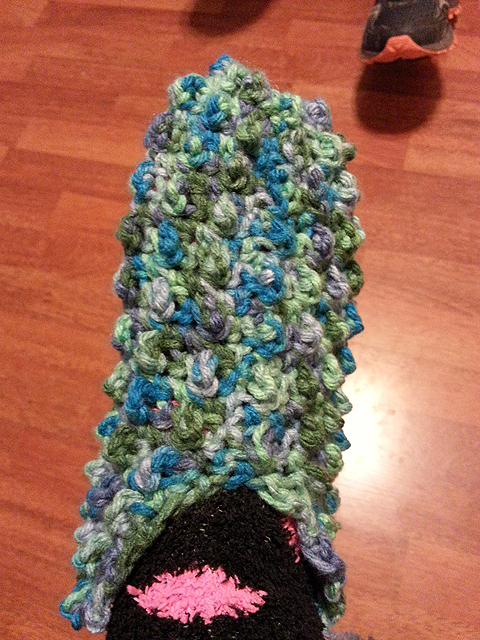 Slipper socks with the additional ridge working a row of back loop, front loop, back loop . One 8 oz. skein 4 ply worsted weight yarn. This creates the portion of the bootie that covers your foot up to the opening your foot will go into. Ch 4, ss to join to first chain to form a ring. Rows 12 to 17 – Repeat Rows 10 and 11 alternately. Rows 20 to 31 – Repeat Rows 18 and 19 alternately. Fasten off and sew up back. 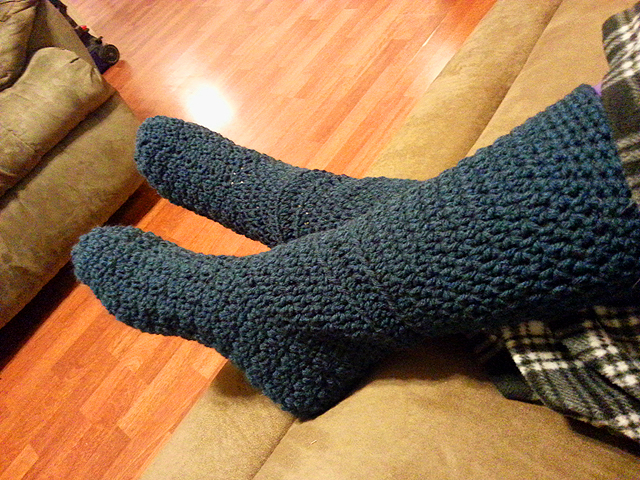 You can add two rows at a time to ensure as snug or loose a fit around your ankle as you like. Foot part plus a few rows of foot opening. EDITED 12-31-14…to remove the chain 2, turn. No need to turn at the end of these rows, and not sure where my head was when I posted. (And this part is ALL me, y’all…trial and error, and stitch and rip out and start again, LOL…) I counted 32 evenly spaced openings around the foot hole to work in (your mileage may vary) so that is how I came up with that number. The trick is that no matter how many evenly spaced openings you have, be sure that you are consistent all the way around while working rounds 1-18. Row 1 – sl st to attach yarn just to the left of the back seam of your bootie. Work 32 hdc in each space around the foot opening of the bootie. (Subsitute 32 with whatever number you came up with as indicated above so that these aren’t too loose or too tight for you.) Sl st to join. Row 6 – ch 2, hdc back loop only all the way around. Sl st to join. Row 7 – ch 2, hdc front loop only all the way around. Sl st to join, ch 2. Row 8 – ch 2, hdc back loop only all the way around. Sl st to join. Row 14 – ch 2, hdc back loop only all the way around. Sl st to join. Row 15 – ch 2, hdc front loop only all the way around. Sl st to join. Row 16 – ch 2, hdc back loop only all the way around. Sl st to join. Row 18 – ch 2, hdc in each stitch around. Sl st to join. Row 19 – ch 1, sc in each stitch around. Sl st to join. Row 20 – ch 1, sc in first st. Decrease four times, then sc in remaining stitches around. Sl st to join. Rows 21-23 – ch 1, sc in each stitch around. At the end of row 23, fasten off.